I feel the need to introduce myself to you before I meet you at the Teen Author Fest next week. I am afraid I will be so in awe that I will either run and hide, or trip over my tongue and look like a blushing fool. This might happen anyway, but we will be on a panel together on Friday called Under the Influence, and I want to keep the possibility of humiliation to a minimum. (We did meet once last spring at a Books of Wonder event and you were incredibly gracious). I'm going to get all Fan Gurl on you now, publicly. I'm not from Texas, but it would seem that we have a lot in common, both of us being preacher's daughters. (I grew up in a seminary in NYC). A wild youth, love of theater and an array of "jobs" before finding our true calling and service: writing in the voice of teens. And Rock Band. 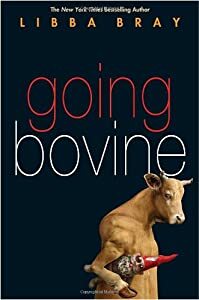 And then I read Going Bovine. I am obsessed with the mystical and the impossible, so from the beginning I knew your book was right up my alley. But you pierced me to the core, Libba. You grapple with notions of reality in ways that I aspire to. I would love to interview you for this blog. I think that my friends here would be very interested to know about the harnessing of your brilliant imagination into fiction. We could meet for some laughs and deep discussion over lattes and cookies. What do you say? Big fans of Going Bovine here. Would love to see an interview! Hey there! Libba responded and was so funny, I almost peed in my pants! I can't wait to hug it out with her! did you hear about her ELBOWS?!? Libba has been on my "to read list" for a couple years. Think I need to bump her up to the top. Arlaina - I JUST caught up with her blog - I probably should have done that before posting this! And Carrie - I think you'll really like her writing!